Selerant has today announced a new version of its flagship platform, Devex 3.8. With Devex PLM, companies can bring more innovation products to market faster with lower costs and higher safety to meet the demands of their consumers. Selerant is proud to sponsor the 20th annual Invest in Kids Jane-A-Thon. The event takes place March 1-2, 2019, in Winter Park, Colorado, and focuses on fundraising for Colorado-based non-profit Invest in Kids. Shanghai, China – August 28, 2018 - Selerant, a leading global provider of formula-based product lifecycle management (PLM) software, today announced that Korea Ginseng Corporation have chosen Selerant’s Compliance Cloud solution to manage food safety regulations and regulatory compliance. NEW YORK--(BUSINESS WIRE)--Selerant, a leading global provider of formula-based product lifecycle management (PLM) software, today introduced their new global identity to communicate how the company helps unify and control all aspects of new formula-based product development and introduction. 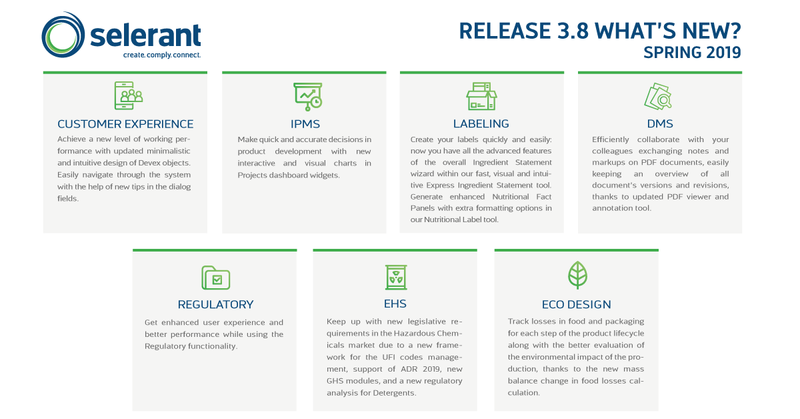 As part of this unveiling, Selerant will showcase the latest version of Devex 3.6, its flagship PLM platform, at IFT18 Food Expo in Chicago. Campari Group, a leading player in the global branded beverage industry with portfolio of more than 50 premium and super premium brands, selects Selerant Devex system to expedite the product management process. New York, New York – May 10, 2018 – Selerant, a leading global provider of formula-based product lifecycle management (PLM) software, today announced a new version of its flagship platform, DevEX 3.6. With DevEX PLM, companies can bring better products to market faster with lower costs and with higher safety. From idea to label, Selerant’s core DevEX PLM platform enables companies to unify and control critical aspects of New Product Development and Introduction (NPDI), including innovation and R&D, specification and formulation management, product portfolio management, compliance, and packaging. Effective Q3 2018, along with the publication of the DevEX 3.7 release, Selerant will no longer support neither IE10 nor any .NET Framework prior to 4.7.1. Tech-Clarity features Selerant's formula-based PLM solution DevEX and its newer DevEX Baseline System in its overview of the process PLM space. New York, New York– March 6, 2018 – Selerant, a leading global provider of formula-based product lifecycle management (PLM) software, today announced the release of its new DevEX Baseline System for food and beverage manufacturers. CIO Review listed Selerant and its formula-based PLM solution DevEX among the top 20 most promising PLM solution providers of 2017.